Just in case anyone was worried I am still doing the Fate/kaleid liner PRISMA ILLYA reviews. With my vacation, Otakon, work, Fate/Grand Order, and other projects I am behind on EVERYTHING. My life since then has just been a game of catch-up. My official goal is going to be to try to knock out with my reviews by the end of the week. We shall see how that goes. If nothing else it is only Primsa Illya. 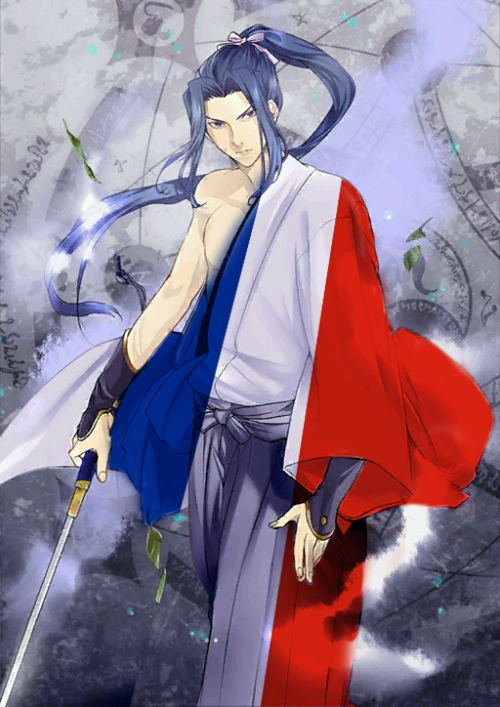 What I really should be focusing on is Fate/Grand Order and the Hero of France. Got to get in on the ground floor of that Kojirou boom before it is too late. There is a bit of an art to picking pictures for blog posts. I will never claim to be the Leonardo da Vinci of screencaps. But I can at least try to keep the pictures here on the classier side of things. With this episode (and the next episode) it is going to be a bit of a challenge. They are finally making it to the long promised (or threatened depending on your point of view) beach episodes. If your mad there are no Illya and Chloe make out pictures I merely directly to the rest of the internet that has talked about this episode before me. Seek and ye shall find. Quite easily in fact. Having survived the attack from Bazett there is not much that Illya and her crew can currently do. They are aware that the previously unknown 8th Card exists somewhere in town but until they can locate it they are in a holding pattern. Until then there is a birthday party at the beach to be had. So swimsuits must be bought, mana replenished, and sleepovers be arranged before the big day. Plus once their birthday party is over they can get down to celebrating my birthday on the 21st. As Alice Cooper once sang, “schools out for summer.” It seems that everyone is excited for summer vacation. Taiga being a big kid is no less enthusiastic. It seems the fan service can no longer be put off. Tatsuko’s beach vacation plan is about to go into effect. If you thought they were going to hunt for cards right away then you have been watching the wrong show. Although the triple birthday is also clearly important. So while this is MOSTLY a scheme to get all the girls into swimsuit and frolic around in the water there is still the fact that Illya, Chloe, and Miyu all share the same birthday. And that can’t be a coincidence. But let us be clear it is mostly so they can be in swimsuits. The plot is the window-dressing not the other way around. Plus Tiaga needs some time off so she can be summoned as Jaguar Man in the greatest Holy Grail War. A solid new opening. I think I liked the first two openings a bit more because their driving beat throughout but when the beat picks up in the second half of this song I think it really comes into its own. If I have any major complaint it would be that Towana’s vocals are a bit too high-pitched for my taste but they are fine for the song. The new opening clearly has a slight emphasis on Miyu. While the trinity of Illya, Chloe, and Miyu is the focus a little extra attention is paid to Miyu. When they slowly pan out to show the main cast you will notice that it is Miyu who is in the center and not Illya. That alone says a lot. Careful observation of her flashbacks during the opening won’t tell you her whole story but the art filled with lots of clues for anyone who has not read ahead in the manga. It is clear that Miyu has a greater connection to Shiro than merely thinking he is cute. Also considering the “Miyu in chains” shot it says a lot about how her childhood shaped her into the odd duck she is today. Oh. One other criticism. While Bazett looks cool in the opening but there is clearly not enough of her. The more Bazett you have the better you are doing. In Yes! Pretty Cure 5 they spend a whole episode in the supermarket before going to the beach. Why? So they can all buy the three carts of food they are going to need for their weekend trip to the beach. That clearly shows that Yes! Pretty Cure 5’s priority was food. (As it should be.) The episode before the beach episode highlights what the creators feel is the heart of the show. Fate/kaleid liner PRISMA ILLYA 2wei Herz! spends most of its episode with the girls buying bathing suits. I think the show’s priorities are very clear as well. Thankfully Tatsuko is here to be the miserable human to whom comedy revolves around (aka the Tomo.) Sure that means they break out the Tatsuko in an angel hair spaghetti string bikini gag but she makes up for it with the rest of the comedy that goes around her. That and forcing Nanaki and Suzuka into speaking like spiteful Maria-sama ga Miteru girls (aka 90% of the cast of Maria-sama.) But Miyu gets come rainbow card comedy in as well. Someone needs to write a doujinshi where Miyu gets to meet Government Crime Investigation Agent Zaizen Jotaro. Admit it. You really want Miyu to say, “Da Bomb!” as she exposes government corruption. It is up to Rin and Luvia to remind everyone that there is an actual plot to the show with a dangerous 8th card threatening the town and possibly the world. I means someone had to. A. Chloe running low on mana. C. Chole and Illya hemming and hawing about kissing. D. Mimi watching them and spazzing out. E. An overly long french kissing scene. I appreciated E and F the most. I’m guessing most people really wanted C and E.
This is about as subtle as Fate/kaleid liner PRISMA ILLYA will ever get. Enjoy it while it lasts. At first I thought that Mimi was the Yukika Saegusa of the series. She is the shy and subtle girl whose good nature made her popular with he cast and audience in equal measure. Someone approaching the level of a Bodhisattva like mascot. But watching this scene in the anime made me realize she is the Izumi Segawa. She is the very quirky moe girl who no one respects in the least. I expect to someone to say, “Even 100 Mimi-sans wouldn’t be enough.” in the near future. So when Miyu totally does not remember her it makes perfect sense. Miyu may view Illya’s friends somewhere between parsley and pet rocks but at least most of them are so loud she can’t help but remember them. Mimi on the other hand is so bad that she seems like an NPC to Miyu. That is some major unintentional Presence Concealment. If nothing else we get some Sella and Leysritt at dinner. It is not Bazett but I will take what I can get. To make sure the episode crams in all the fanservice it can hold in one episode they make sure that the trio bathes together as well. This leads to some pajama jokes and Shiro is a pervert jokes. Because of course it would. Shiro. Was your biological dad Rodney Dangerfield? Because you get no respect. Also it is clear that Irisviel is a mixture of her traditional Fate/Zero version and bit more of her pleasantly sadistic and grail tainted Instructor Iri version from the Einzbern Consultation Room. You can take the Girl out of the Grail but you can’t take the Grail fully out of the Girl. The song itself is fluffy pop but in a very enjoyable way. I will put it this way: I would attend a Yumeha Kouda concert at Otakon. OH! I did not realize that Yumeha Kouda is also Stella Gakumazawa in the show. She is a small enough character that was very easy to miss. Some quite notes about the ending. The first is they always do a good job of having Illya, Chloe, and Miyu being very distinct in these endings. In this case how they make the pancakes and their toppings are very reflective of their personality. It is a minor touch but it does show that the anime is very aware of the girls and how they differ from each other. Also they are making the pancakes for themselves and not for say Shiro. That is a small but nice little decision. It was only a mater of time. The beach episode could only be put off so long. Episode 2 is where is all goes down. But do not worry. She is here to save the day. The woman who should rightfully have the title Humanity’s Strongest Contractor. Just have an ice pop.